This article will go over some of the most powerful nuclear weapons ever detonated. Although the power of a nuclear bomb is measured by its nuclear weapon yield, it is important to note the destruction it can cause to humanity. In that case the most destructive bombs are the Little Boy dropped on Hiroshima and the Fat Man dropped on Nagasaki. The power to completely destroy communities, towns, ecosystems, and economies all at once is a very great responsibility that humanity now has. It is important that every human on earth makes their own choices and understands the consequences of their actions. A man who blindly follows others is not a man at all, and never before have the implications been so great. A nuclear bomb has limitless power, and the consequences that follow are limitless as well. With that quote let it be understood that it is the responsibility of every individual to prevent war. You need to make informedâ? decisions, take part in yourâ? government, ask questions, and make changes. For the first time in the human history, war may finally be eradicated, yet at the same time such tools have been invented that humanity may eradicate itself. When referring to the power of a nuclear bomb people either say how many times more powerful it is then Hiroshima, or the megaton force it can yield. For example the average nuclear bombs can yield 1 megaton of TNT. This is about 80 times greater yield than Hiroshima. Some people misunderstand that statement thinking that it is actually 80 times more destructive, when that is not true. Since most of the force is concentrated at the center; a bomb that is 80 times more powerful then Hiroshima would only be 6 times greater at the center. A bomb such as the Tsar created by the Russians is said to be 4,000 times more powerful than Hiroshima, when it is actually 6 or 7 times more destructive. The total diameter of the explosion will be larger as well, but it will not be 4,000 times greater. Don’t be misled by the yield of a bomb, and the actual destruction it can cause. 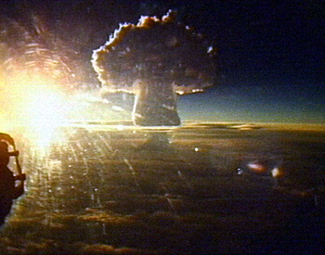 The Tsar bomb is the largest, most powerful nuclear weapon ever detonated. It had a yield of about 50 megatons of TNT. The bomb was also referred to as “Kuz’kina mat” by the Russians. In English this translates to something similar, “We’ll show you something that has never been done before”! It was originally supposed to have a yield of 100 megatons of TNT, although it was reduced to cause less damage to the environment. Only one of these bombs was built and tested on October 30, 1961. 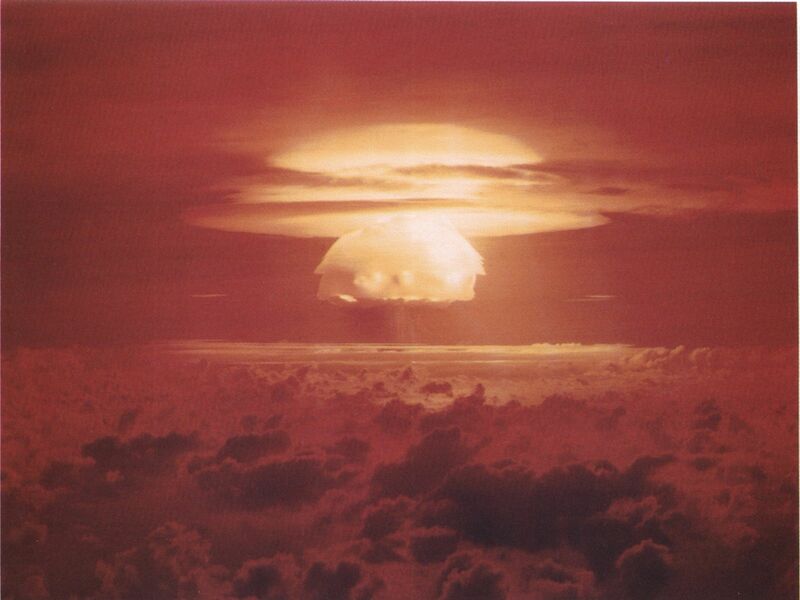 Castle Bravo was the first U.S. test of a dry fuel thermonuclear hydrogen bomb. It had a yield of 15 megatons and was the most powerful nuclear device detonated by the United States. The bomb was detonated on March 1, 1954 at Bikini Atoll, Marshall Islands. Castle Bravo was the first test of Operation Castle, and had unintended fallout; which poisoned the islanders there and the crew of Daigo Fukuryu Maru, a Japense fishing boat. Castle Yankee, code named “Jughead”, had a yield of 13.5 megatons. It was detonated on May 5, 1954. Yankee was intended to be a simpler and lighter version than Ivy Mike. This bomb was tested in the Bikini Atoll Islands. Castle Romeo was the code name of the first U.S. detonated thermonuclear bomb. It had a yield of 11 megatons and used “dry” fusion. Romeo utilized lithium deuterium fuel for the fusion stage, as opposed to the first Ivy Mike nuclear weapon which used cryogenic liquid deuterium. Castle Romeo was detonated on March 27, 1954. This bomb was part of Operation Castle. This part-thermonuclear device was created before Castle Romeo, and detonated on November 1, 1952. It had a yield of 10.4-12 megatons. Its physical size and fusion cell type was not suitable for use as a thermonuclear weapon. Ivy Mike was also part of Operation Ivy. Click here to find out what would happen after a nuclear war . . . Fantastic article! I think that the current worry trend is global warming, but we are far more at risk in the short term of a nuclear war. Especially with stress via oil shortages and religious extremists. In the 70s there were lots of anti-nuclear protests, but the trend has died and now it’s global warming. The only way to scrap nuclear weapons and bring together every country to tackle global warming I think is to have a world, centralised government. When I checked it out I came away with burns over my entire body and just under 24 hours to live. Not bad, as I could still have a pint of Guinness and a KFC Zinger burger before I pop off into the unknown I guess. Yeah I saw that website as well while researching these bombs. I was also going to link to it in the comments 😛 I came off with the same injuries… Which was kind of disturbing. KFC? More like NFC (Nuclear fried chicken) and humans for that matter…. Nuclear weapons are one of the most devastating discoveries of mankind. Those weapons deserve to be called weapons of mass destruction because of their potential to kill millions of people in a short period of time and their long term effects is also deadly. It’s just depressing that the discovery of nuclear fission can lead to a discovery of these weapons. I think these weapons may not only start or end a war but also an end many people’s lives. These things may be even worse once they are created…. Here’s a link to a video focusing on the Tsar Bomba . . .